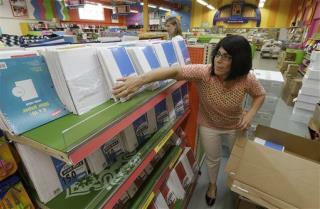 (Newser) – With school budgets being slashed across the country, more and more teachers are paying for classroom supplies with their own money, according to a new study. The survey, by Horace Mann insurance, found 26% of teachers polled reported spending $400 of their own hard-earned on school supplies last year—up 3% from 2011—and 53% said their school's budget had been cut, reports USA Today. DonorsChoose.org, a charity that helps teachers raise money for supplies, says requests from teachers grew 30% last year. We as a nation are spending anywhere between $6212 (Utah) and $19,076 (NY) per student for education in the US. Assuming a class size of 25 kids, that is $155,300 to 476,900 per classroom. Assuming the teachers make $60,000, that still leaves a whole lot of money for supplies and other things. Perhaps the schools should look to reduce their overhead (Non-teaching Staff), and return more of that money to actual classroom support! That amounts to eight tenths of one percent of the income of a first year teacher in my local school system. Funny how they whine about their costs, but could care less about raising my taxes to pay for their bigger salaries and better free health care. The last levy raised my taxes 800 dollars a year, which is more than 6 percent of my income. I feel no sympathy for them at all. Teachers are allowed only $250 off their IRS income tax for school supplies. My best friend is a school teacher in Virginia. I help with the school supplies by either going shopping at the same time and getting what is needed or simply giving money to help offset some of the supplies. I am a part time teacher - and I donate some of my salary to providing supplies to the kids that I teach. Supplies are anything from pencils to food. I think the school teachers need a bigger amount deduct from their earnings.